Leather can naturally take a beating over time. If you want to clean, restore, and maintain your leather items, special care is required. Fortunately, leather cleaner can make the work easy for you. It can remove dirt and grime from automobile interiors, spills and stains from apparel, and dirt and debris from handbags. Whether you want to clean your leather shoes and accessories or need to spruce up an old leather couch you just purchased, a quality leather cleaner is the first thing you need. The right cleaner can restore your leather, making it look and feel like new. Many cleaners are easy to use and may even contain a conditioner in one, making it easier than ever to protect your leather auto interior, furniture, clothing, and more. For best results, use a leather cleaner once or twice per week. 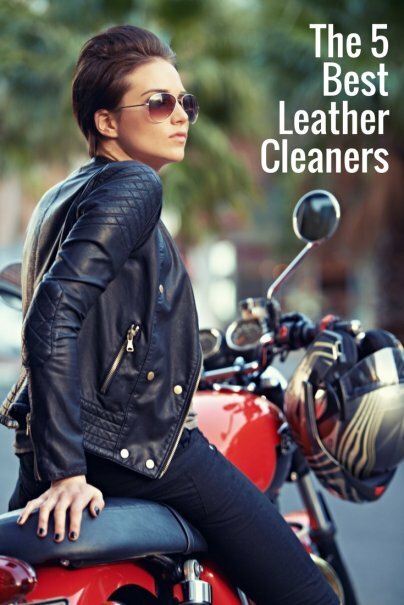 Leather cleaner is a special cleaner that will remove dirt and stains from your leather, while helping to protect, repair, and maintain the surface so that your leather items will look better for longer. Using a leather cleaner will protect your investment by removing impurities and restoring the leather’s natural oils. It can even help protect your car seats and other leather auto interior from the damaging effects of the sun. In most cases, it is best to spray or apply the leather cleaner onto the leather surface and then using a microfiber cloth, gently wipe or buff it in using a circular motion. Usually, you will need to wait about 30-45 minutes to let the area completely dry after applying the cleaner. While most leather cleaners can work on virtually all leather and vinyl surfaces, they should never be used on suede or nubuck. Leather Cleaner by Leather Honey is an award-winning leather cleaner that works great on leather apparel, furniture, auto interiors, shoes, bags, saddles and tack, vinyl, microfiber, faux leather, and accessories. It is extremely versatile and can work on both finished and unfinished leather. The natural ingredients won’t harm your skin or any leather surfaces, and won’t cause any changes to the color or texture of your leather. The premium concentrated formula can quickly and gently remove dirt, oil, stains, and grime. It uses all natural non-toxic ingredients to minimize damage and discoloration of any surfaces. If you're unsure of which leather cleaner is right for your valuable possessions, this is your safest bet. However, you will need to take into consideration the extra step of diluting the concentrate with water before applying it to any leather surface. This affordable bottle makes up to 32 ounces of leather when diluted with water, which can last for several years on your shelf, making this small bottle an incredible value. As one of Amazon’s best sellers in leather care products, this Leather Cleaner by Leather Honey is also backed by outstanding customer reviews and “before and after” photos online. The company has also successfully been in business since 1968 with millions of happy customers, so they know what it takes to help clean your leather and make it last longer. There's also a lifetime guarantee to ensure you are completely satisfied. The Leather Honey Leather Conditioner is another bestselling item from the brand that can leave your leather conditioned and looking better than ever. 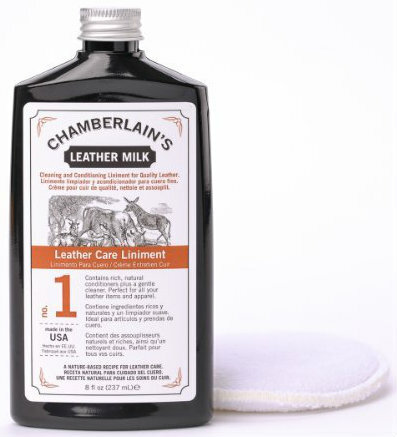 Leather Milk Natural Leather Care Liniment No. 1 was originally formulated for, and exclusively used by, Saddleback Leather Company. The milky, water-based solution will gently nourish, strengthen, restore, and preserve your leather surfaces with each use. The safe, all-natural recipe contains no chemicals and is made with high quality, leather enriching ingredients and a gentle cleanser to safely clean and condition your leather in one. It is ideal for all leather items, including auto interiors, furniture, baggage, shoes, saddles, tack, apparel, accessories, and more. There is a subtle almond fragrance to compliment the leather’s natural scent. It also includes a free reusable cotton terry applicator pad to help you achieve the best results. As one of Amazon’s best sellers in leather care products, this is also backed by outstanding customer reviews online, including nearly 900 five-star reviews. In fact, many reviewers found that they had great results with this cleaner, even in cases where other cleaners had failed, such as on old leather furniture that needs to be restored. Meguiar's Gold Class Rich Leather Cleaner and Conditioner spray works well on all types of leather in the home and closet, but is especially ideal for vehicle interiors thanks to its UV inhibitors. It is commonly recommended by auto enthusiasts because it can help prevent premature leather cracking, fading, and weather damage caused by leaving your car out in the sun. Using gentle and safe cleansers and moisturizers, the non-whitening formula can effectively clean your leather and protect it from spills, stains, and aging. The unique spray formula with aloe has the texture and feel of a conditioner, so it won't leave behind any streaks or greasy residue. It also has a great smell that will last all day. The convenient spray cleans, conditions, and protects in one easy step; simply spray and wipe it on. The affordable spray cleans and conditions in one, so you won't have to purchase two separate products, making it an even better value. This award-winning versatile Leather Nova Leather Cleaner is ideal for use on all leather surfaces, including bags, shoes, auto interior, furniture, saddle, and more. It is safe from all leather, vinyl, and plastic, and has no harsh detergent or ingredients. The pH-balanced formula will deeply penetrate the pores of the leather to remove set-in dirt, grime, and oil. This premium cleaner can even reduce the toughest stains that other cleaners leave behind. The no-rinse cleanser will quickly, effectively clean and protect your leather surfaces, while preventing discoloration and dullness over time. It won't strip essential oils from your leather, which can help prolong its natural shine, luster, and softness. The cleaner won’t leave any messy oily or soapy residue, dries quickly, and prepares the leather for conditioning by opening the pores. All you need to do is simply spray the cleaner directly onto the microfiber towel and massage it in circular motions into the leather surface. Then, use a clean dry cloth or microfiber towel to wipe away any dirt and oil that has lifted to the surface. It has a very light scent, which will dissipate quickly. The bottle also comes with a free microfiber towel to help you get the best results possible. As one of Amazon’s best sellers in leather care products, this is also backed by a one-year guarantee and outstanding customer reviews online, including more than 900 five-star reviews. It is also commonly recommended by auto enthusiasts because it works great on vehicle interiors. 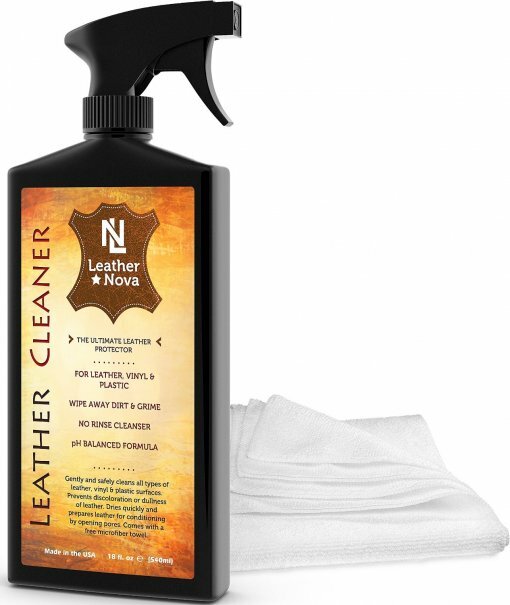 Leather Nova also makes a bestselling leather conditioner and cleaner, as well as a leather conditioner and restorer. You won't find a faster, easier way to clean your leather than the Mr. Leather One Step Liquid Spray. This spray will instantly clean, shine, and protect all types and colors of leather. You don't even need to rub or buff it in; you simply spray and wipe it on. It will moisturize your leather to leave it feeling more soft and supple, while helping to prevent dulling, drying, cracking, and fading. The advance formula will also help repel water and restore your leather’s natural beauty and shine, so that it looks better for longer. It leaves no oily or greasy residue and also has a great leather scent. It works on all leather in the home and auto, including on furniture, clothing, shoes, luggage, and more. The affordable spray cleans and conditions in one, so you won't have to purchase to separate products, making it an even better value. As one of Amazon’s best sellers in leather care products, this is also backed by outstanding customer reviews online. It is also commonly recommended by auto enthusiasts because it works great on vehicle interiors. And those are our recommendations for the best leather cleaners. As always, be sure to check Wise Bread's Buying Calendar to learn when and how to buy just about anything! i just buy a new car and looking for the leather cleaner. thanks for this helpful article. I own leather furniture but I have run into a dilemma of sorts. My couches are made of a combination of smooth leather and actual animal hide. Do you have any thoughts on cheaper ways that I could clean and maintain the furniture that I bought at http://www.Brumbaughs.com? Traditional creams and other chemicals do not really do the trick.